The little festival that could! 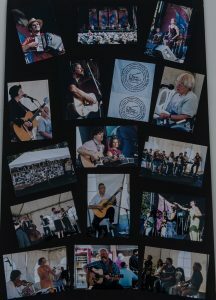 From its humble beginnings as a one-day event in 1994, the CKCU Ottawa Folk Festival has developed into one of the best folk festivals in Canada. In 2003, we celebrated the sheer joy of showcasing Canadian culture through music, dance, storytelling and crafts for the 10th consecutive year. Max Wallace, then station manager of community radio station CKCU-FM, discussed the idea of a folk festival on the CBC Radio show All in a Day. Wallace was soon contacted by Chris White, an Ottawa performer who headed the local songwriting collective, Writer’s Bloc. They met to discuss the idea and on a September eveningin 1993 at Carleton University’s Mike’s Place, the CKCU Ottawa Folk Festival was born. The steering committee met regularly for a year to organize the first festival. The committee included Gene Swimmer, Chris White, Max Wallace, Pam Marjerrison, Sheila Ross, Barry Pilon, Roberta Huebener, Chris Brown, Suzanne Lauzon and Joyce MacPhee. Local businesses such as the Ottawa Folklore Centreoffered financial sponsorship, while individuals such as Chopper McKinnon, host of the CKCU-FM folk radio show Canadian Spaces, and Dean Verger, owner of Rasputin’s Folk Café, offered valuable advice and support. Karen Flanagan McCarthy, the arts reporter on the CBC Radio show All in a Day agreed to co-host with Chopper and they have become regular hosts on the evening main stage. The festival was launched on August 28, 1994, with a full day of entertainment on Victoria Island. The five afternoon stages featured Ottawa Valley fiddling and stepdancing, world music, a tribute to Stan Rogers and a ceilidh. The main stage performers included Valdy, David Wiffen, Ian Tamblyn, Lynn Miles and Dario Domingues. In comparison, the 2003 festival featured eight daytime stages and, for the first time, a fourth evening of entertainment. In its second year, the festival moved to Britannia Park, known for its scenic location on the Ottawa River, as well as for gorgeous sunsets. Then in 1996, the festival ran into its first major challenge. In the fall, CKCU was forced to withdraw its organizational support, putting the 1997 festival in serious jeopardy. The crisis was averted when Arlo Guthrie performed two sold-out benefit concerts at the National Library Auditorium in December. A group of volunteers led by Carol Silcoff raised additional funds by organizing a silent auction in conjunction with the concerts. Volunteers continue to play a vital role in the festival’s continued success. Each year as the festival approaches,the core team of approximately 20 grows to more than 400 volunteers who work hard to make the event run smoothly. Some of the volunteers plan their vacation time around the festival, and there are a number of families who have been volunteering since the first year. Ottawa Folklore Centre owner Arthur McGregor opens each festival by performing his trademark acousticversion of “O Canada”. He was not the only first-year performer who returned in year 10. 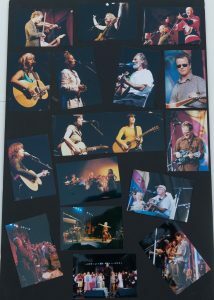 Lynn Miles, Ian Tamblyn, Terry Tufts, Finest Kind and Tony Turner were among the many 1994 performers who returned in 2003. Our wonderful emcees, Chopper McKinnon and Karen Flanagan McCarthy, who have contributed enormously to the success of the festival since day one, made their usual spirited contributions to the festival. They were joined in their emcee duties by Michel Dozois, producer of the National Arts Centre’s Fourth Stage,and Rachel Hauraney, a professional writer and radio host who has been a festival volunteer since 1994.Rachel’s parents, Phil and Cari Hauraney, are among the scores of volunteers who returned for a 10th year to help the festival run smoothly. The first-ever Thursday evening concert at the CKCU Ottawa Folk Festival opened with Arthur McGregor’sacoustic guitar rendition of “O Canada”. Ottawa Mayor Bob Chiarelli welcomed the crowd. Shauntay Grant, a young performance poet from Halifax, delivered her spoken-word compositions to an appreciative crowd.Jesse Zubot and Steve Dawson, two brilliant Vancouver performers, demonstrated why they are rising stars of the folk and roots music scene. Their high-energy acoustic music is infused with elements of jazz, bluegrass, world music and folk. Following the intermission, Prince Edward Island fiddler and stepdancer Richard Wood entertained with his instrumental virtuosity and stunning showmanship. Dar Williams received a warm welcome. Her evocative voice and beautifully crafted songs captivated the audience. The evening ended on a high note with the young Calgarian twins Tegan and Sara, whose performance showed a punkier, poppier edge to their acoustic sound. The twins were given a loud and enthusiastic reception, especially from the young fans who turned out for their show. The evening entertainment on the CUPE Main Stage began with Leela Gilday, a singer from Yellowknife whose classically trained voice touches audiences on spiritual and emotional levels. Leela was followed by the traditional Québécois band Le Vent du Nord whose members sing and play instruments such as the hurdy gurdy, piano, violin, guitar and accordion. Many festival goers were familiar with stepdancer/accordionist Benoit Bourque, who had previously performed at the festival with the band Matapat. Juno Award-winner David Francey charmed one and all with his poignant and moving story songs. The singer-songwriter accompanied himself on guitar and was joined by guitarist Dave Clarke and multi-instrumentalist Geoff Somers. The mood next shifted to the infectious world-beat rhythms of The Mighty Popo who appeared with his seven-piece band. Influenced by the music of his native Burundi, the guitarist and singer combined blues, reggae and African styles in his set. Two celebrated female performers, one Canadian and one American, followed the intermission. Lynn Milesentertained her loyal following with melancholy songs of love and longing. The singer-songwriter demonstrated her enormous talents, which won her a well-deserved Juno Award earlier in the year. Emmylou Harris is an icon of contemporary American roots music. She was greeted with great warmth by the crowd, many of whom were hearing the veteran songstress in concert for the first time. Emmylou’s elegant setblended elements of country, folk, bluegrass and pop, and was punctuated by her commentary delivered in a charming Southern accent. The audience witnessed an outstanding performance by the queen of alternative country music. After Hours Music at the Travelodge included performances from Alise Marlane, Angie Nussey, Harmony Trowbridge, Steel Rail, The Toasted Westerns, Kim Barlow and The Laws. The daytime sessions took place on eight stages starting at 11:00 a.m. Another popular festival feature was theCraft Village featuring 23 artisans. The CUPE Main Stage kicked off with Here’s to Rasputin’s, a session hosted by Rasputin’s owner Dean Verger. Performers Ian Tamblyn, Lynn Miles and Terry Tufts have appeared frequently at the legendary folk café. Emmylou and Friends, hosted by Rich Warren, featured Emmylou Harris, Jane Siberry and The Laws. Michel Dozois hosted Québecexplosion, showcasing the talents of Le Vent du Nord, Éric Beaudry, André Brunet, Sandy Silva and Pierre Belisle. The tribute to Canadian Spaces session was led by Chopper McKinnon, host of the longest-running folk show on community radio in Canada. Artists who have appeared on the show, including Aengus Finnan, David Francey, Jane Siberry and Steel Rail, were on hand to help Chopper and the Space Cadets in the audience celebrate. The Ottawa Folklore Centre Stage debuted with Fiddle Plus, hosted by Nathan Curry, a veteran Celtic musician who was joined by André Brunet, Gordon Stobbe, Olivier Demers and Soozi Schlanger. Arthur McGregor hosted a folky singalong titled Rise Up Singing, named after the songbook of the same name. Exotic rhythms and expressive dance next took centre stage with a Learn to Bellydance workshop. The Terry Penner Memorial Festival Choir had a rehearsal before piano wizard Peter Kiesewalter hosted Keyboard Basics. Theday’s activities ended on a gentle note with Kindermusic led by Barb Smith. 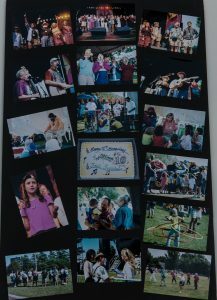 The CKCU-FM Family Area, located in the main field, was a busy, fun place for kids of all ages. The crafts, games and storytelling began at 11:00 a.m. and went on until late afternoon. Mini-workshops that allowed family members to create their own masterpieces were hosted by Glass Works, Filament and Solar Woodcuts. On the Bowie Electrical Stage, the Taking Turns sessions allowed performers to strut their stuff. Mike Plume;Alise Marlane and Leela Gilday; and Alicide and Christine Fellows entertained throughout the afternoon.Raven Kanatakta, an eclectic young singer-songwriter from Northern Quebec whose influences include his native Algonquin heritage as well as jazz, blues and folk traditions, and ShoShona Kish, a singer-songwriter, spoken word artist and dancer originally from Toronto, performed solo sets. Kim Barlow, a Whitehorse-based artist who plays guitar, banjo and cello, appeared with her trio. The New Brunswick duo Isaac and Blewettclosed the day’s entertainment with music that featured Tim Isaac on cello and Jim Blewett on guitar. The Kershman-Wasserlauf Stage in the Ron Kolbus Lakeside Centre kicked off with Galitcha and Friendsfeaturing Benoit Bourque, Kathy Armstrong and the Kim Barlow Band. Planet Drum was a rhythmic event hosted by Kathy Armstrong showcasing the percussive talents of Kebba Jobateh, Pepe Danza and Wayne Hamilton. The Ottawa Citizen Family Concert 1, hosted by The Celtic Rathskallions presented the hilariousTrout Fishing in America. JouTou hosted Around the World in 60 Minutes, a workshop with an eclectic lineup of Dean Verger, Galitcha and Tracey “Halyma” Vibert. Dance with Popo challenged anyone within hearing distance to stay still during a set from the irrepressible bluesman The Mighty Popo. Entertainment on the Nutshell Music Stage opened with Out of Left Field with Ann Downey (host), Angie Nussey and Bob Snider. Guitar Delights featured an impressive trio of guitar heroes including host David Woodhead, Dave Clarke and Roddy Ellias. Leela Gilday hosted Northern Exposure, a session with a roundup of northern artists that included Kim Barlow. All the News That’s Fit to Sing (Phil Ochs’ Legacy)was the intriguing title of a session that explored the music of the late great American folksinger. Phil’s sisterSonny Ochs hosted the session with Arthur McGregor and Maria Dunn paying homage to Phil Ochs. Ron Moores, host of the CKCU-FM traditional country, western and bluegrass music show The Back 40, led a session of the same name featuring Keith Glass, Steel Rail and The Laws. On the Rogers Stage, Karen Flanagan McCarthy hosted the Gardening Show with gardening expert Ed Lawrence and the poetry and music of Susan McMaster & Geode. Gord Peeling, host of the CKCU-FM Celtic music show Music from the Glen, led a session of the same name with Bobby Watt, Finest Kind, Linda Miller & Nathan Curry, and Nicolas Boulerice & Bernard Simard. Carolyn Sutherland hosted Heart Strings, an evocative session with string-y professionals Buddy Miller, Lynn Miles, Mike Plume and Wendell Ferguson. Atlantic Scene Revisited, hosted by Heather Moore, featured Gordon Stobbe, Harry Martin, Isaac and Blewett and Shauntay Grant. Shelley Posen hosted the Funny, Eh? session with punsters Bob Snider and Trout Fishing in America. The algörithms inc. Stage rolled out with The Edge of Folk featuring Shauntay Grant (host), Alicide andHarmony Trowbridge. The latter performer hosted Generation F, showcasing young performers Amanda Rheaume and Stephanie Clement. Morna Ballantyne hosted Working Folk, a session with songs about work performed by David Francey, Ian Robb and Maria Dunn. Words Plus Music presented spoken word and musical accompaniment from host Sheila M Ross & Scot P Dunlop as well as David Woodhead, Sandra Nicholls & Roddy Ellias. The day wound down with a Gordon Lightfoot Tribute. The tribute, hosted byAengus Finnan, featured Ian Tamblyn, Alise Marlane and Terry Tufts, who shared their favourite memoriesand tunes of one of Canada’s most beloved folksingers. The Saturday evening entertainment on the CUPE Main Stage began with the rollicking supergroup Betty and the Bobs. The band had the audience grooving and swaying with their smorgasbord of country, jazz, blues and R&B. The energy level remained high with talents from far away: the Australian band Fruit, and the British-born singer-songwriter Zoë Lewis, who was accompanied by Roxanne Layton. Audience favourite Ian Tamblynnext entertained with some of the classic Canadian folk songs he has written, including “Woodsmoke andOranges”. Between numbers, Ian reminisced about his performance at the first festival. Following the intermission, festival favourites The Arrogant Worms delivered their own wacky take on Canadian life and culture. Audience participation was encouraged! The Helen Verger Award was presented toJane Siberry before she performed a mesmerizing, moving set. The main stage performances ended with La Bottine Souriante, an exuberant nine-member group that performed numbers ranging from traditional Québécois tunes to jazzy originals. The festival goers who weren’t ready to sleep yet on this particular Saturday night went to the After Hours Music at the Travelodge to groove with Bob Snider, Betty and the Bobs, The Arrogant Worms, Aengus Finnan and Isaac and Blewett. On the CUPE Main Stage, the day opened with Tony Turner hosting This Land of Ours, a session celebrating songs about Canada and featuring singer-songwriters Keith Glass and The Laws. Bill Stunt, host of the CBC Radio show Bandwidth, hosted Bandwidth Live 1, a session showcasing the talents of Ron Sexsmith, Sarah Harmer and Ray Montford. Simply the Song featured veteran songwriters Buddy Mondlock, Ian Tamblyn and Jane Siberry, and was presented by Mike Regenstreif, host of the Montreal radio show Folk Roots/Folk Branches. Two supergroups, Betty and the Bobs and VSH, as well as Bob Snider appeared in the session CBC Bandwidth Live 2, hosted by CKCU-FM station manager and CBC arts journalist Matthew Crosier. The Ottawa Folklore Centre Stage entertainment began and ended with the Terry Penner Memorial Festival Choir rehearsing with choir director Mike MacDonald. The All in the Family session was hosted by Searson, a talented Ottawa Valley family quintet specializing in traditional music, and featured Ivonne & Kalissa Hernandez. Roxanne Layton led the Learn to Play the Recorder session. Livewire Zoё Lewis presentedThere’s Music in Everything (for kids). Banjo player Mary Gick, a lover of traditional American styles, hosted the Old-Time Music session with other trad fans including Ann Downey, Gordon Stobbe and James Stephens. The CKCU-FM Family Area provided ongoing crafts, games and storytelling. Three nifty Crafts for Kidssessions were hosted by Kinsella Crafts, Glass Works by Burkes, and White Trash Ink. Costumes and musical instruments were optional, but fun was mandatory in the Sunshine Parade, which wound its way from the Family Area to the CUPE Main Stage and back. Kathy Armstrong led kids of all ages in a joyful and noisy parade. The Bowie Electrical Stage opened with the traditional sounds of Red Wood Central, otherwise known asMichelle “Red” April and Al Wood. Three Taking Turns workshops featured solo sets by Bobby Watt andBob Snider, Tony Turner and Suzie Vinnick, and Amanda Rheaume and Angie Nussey. The whimsicalMagoo was followed by Searson. The Kershmann-Wasserlauf Stage in the Ron Kolbus Lakeside Centre was the setting for sessions featuring an array of traditional music. The old-fashioned fun kicked off with Linda Miller and Nathan Curry (host) andMagoo. The Contra Dance for Everyone session was led by The Old Sod Band with caller Catherine Burnsand encouraged audience participation in a traditional folk dance. In a different flavour, the Cajun Dance Partyfeatured Poutine Étouffée. One Instrument, Many Cultures was a session featuring guitarists Juancho Herrera (host), André Thibault, Nathan Curry and Ray Montford. The Mother Earth session featured the band Fruit (host), Shauntay Grant and Wolf Moon (Sheila M Ross and Scot P Dunlop). The Nutshell Music Stage opened with Strings Unlimited featuring Ray Montford (host), Isaac and Blewettand Qiu Xia He. Things turned comical with A Laugh and a Half, a session hosted by The Arrogant Wormsand featuring Magoo and Zoё Lewis. World music was the focus of Music of the Diaspora with Kleztory(host), Juancho Herrera & Michal Cohen. Paul Symes, owner of The Black Sheep Inn, hosted a session with performers who had played at the popular Wakefield, Quebec club including Alise Marlane, Mike Plume, Ron Sexsmith and Stephanie Clement. The day ended on a tasty note with Cajun Bagels showcasing the talents of Poutine Étouffée (host) and Kleztory. The entertainment on the Rogers Stage began with the session Voices in Harmony with Finest Kind (host),Fruit (trio) and VSH. A Mighty Wind Instrument was hosted by The Celtic Rathskallions and showcasedMel Watson and Peter Kiesewalter. There was definitely something fishy going on during the Fishing with Worms session that brilliantly paired funsters Trout Fishing in America (host) with The Arrogant Worms. The mood shifted from the ridiculous to the sublime with the session Sources of Inspiration with Alicide andChristine Fellows. CKCU-FM Ottawa Folk Festival Director Gene Swimmer hosted the final session of the afternoon with the Director’s Choice session featuring Buddy Mondlock and Zoё Lewis & Roxanne Layton. Christine Fellows and Maria Dunn were the first entertainers on the algörithms inc. Stage with the Prairie Sirens session. The Adventures in Music session hosted by Amanda Rheaume featured Maria Dunn andRaven Kanatakta & ShoShona Kish. Rocker Mike Plume hosted the Lost and Profound session withChristine Fellows, Elana Harte and Kim Sheppard. The adventure continued with the Acoustic Blues session hosted by Isaac and Blewett and featuring Raven Kanatakta and Red Wood Central. The entertainment for the day ended with The Travelling Musician session showcasing Aengus Finnan (host), and Juancho Herrera & Michal Cohen. The final evening performances on the CUPE Main Stage began with the wonderful three-part harmonies ofVSH (Suzie Vinnick, Kim Sheppard and Elana Harte), whose group members are also solo performers in their own right. JouTou gets its name from the French phrase meaning “play everything”. And they do! Theirexciting blend of influences includes Chinese, South American, Irish and Québécois cultures. American singer- songwriter Buddy Mondlock and the American folk festival favourites Trout Fishing in America, delivered sets before the Terry Penner Memorial Festival Choir performed, led by Mike MacDonald. A highlight of their music was the Stan Rogers classic “Bluenose”. After the intermission, the trio Finest Kind gave a rousing performance of their traditional material. Ron Sexsmith, the wildly popular singer-songwriter from Toronto who is gaining international acclaim, delivered an evocative set. Rising star Sarah Harmer was received warmly by the audience throughout her spirited performance. Near the end of the evening, many of the Festival organizers joined the Terry Penner Memorial Festival Choironstage to sing “Happy Birthday”. 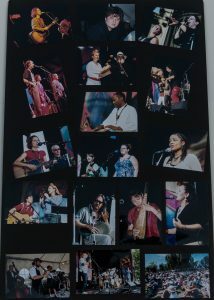 The audience joined in and so ended the 10th annual Ottawa Folk Festival.